When I look out our windows, it’s hard to imagine that Seedy Saturday has already come and gone for 2013. Shane attended last Saturday with our coffee and tea, serving our fairtrade coffee and tea by the cup to all the seed swappers and shoppers. 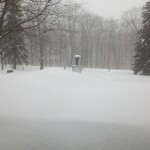 There are so many of us excited about starting seeds already even though the garden soils are covered with many feet of snow. I feel the spring heat in the sun though, and before we know it that snow will be gone. 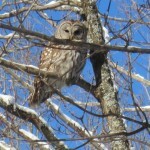 We have had a couple of Barred Owls hanging around our property “hoo” will be very happy to see the snow gone, too. We think they are finding it difficult to get enough to eat through the deep snow, and have resorted to hanging around our birdfeeder where there are lots of juicy squirrels sneaking the dropped seeds. 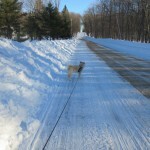 Bertie the Fairtrade Dog enjoys the high snow banks on our walks.